FROM: HQ 373RD FIGHTER BOMBER GROUP, APO 141, US ARMY, 7 JUNE 1944. 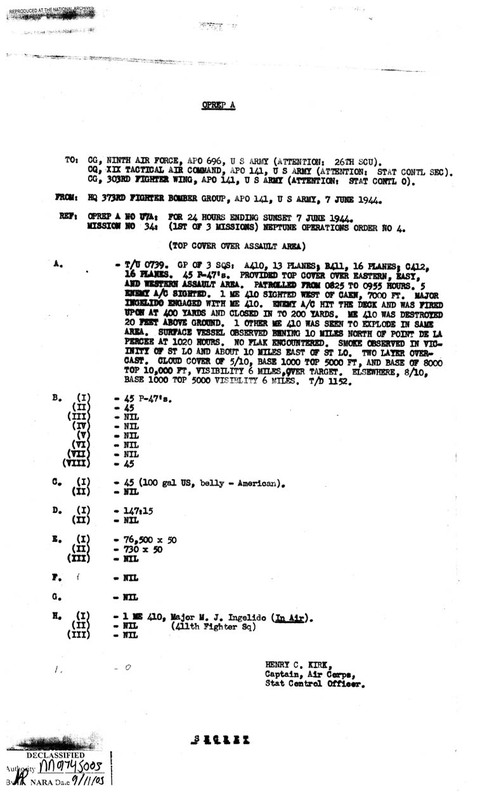 REF: OPERP A NO U7A: FOR 24 HOURS ENDING SUNSET 7 JUNE 1944. MISSION NO 34: (1ST OF 3 MISSIONS) NEPTUNE OPERATIONS ORDER NO 4. BASE 1000 TOP 5000 VISIBILITY 6 MILES. T/D 1152. B. (I) - 45 P-47’s. C. (I) - 45 (100 gal US, belly - American). H. (I) - 1 ME 410, Major M. J. Ingelido (In Air).